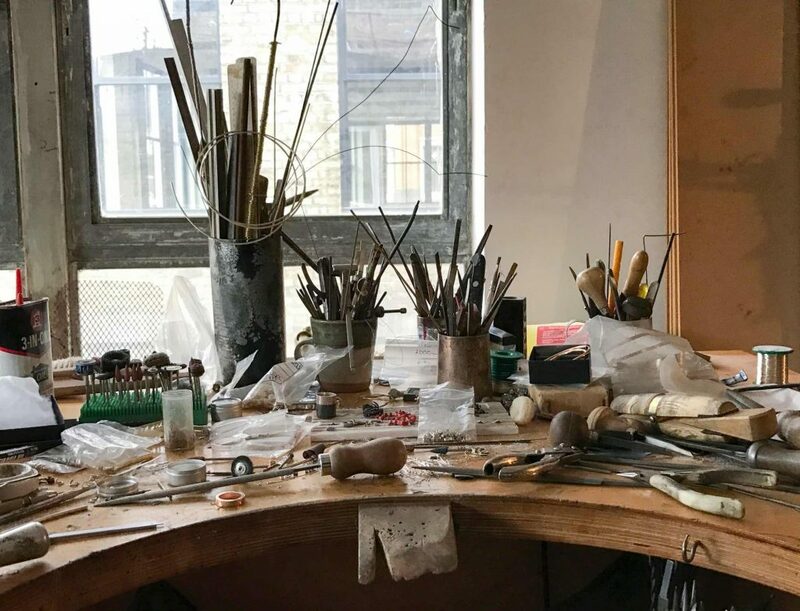 Above: Award-winning, London-based jewellery designer and former Central Saint Martins lecturer, Sian Evans in her Clerkenwell studio. Do no harm. Rethink. Recycle. Redesign: The tagline of Sian Evan’s Instagram account is an apt introduction for her individual style of “slow jewellery”. 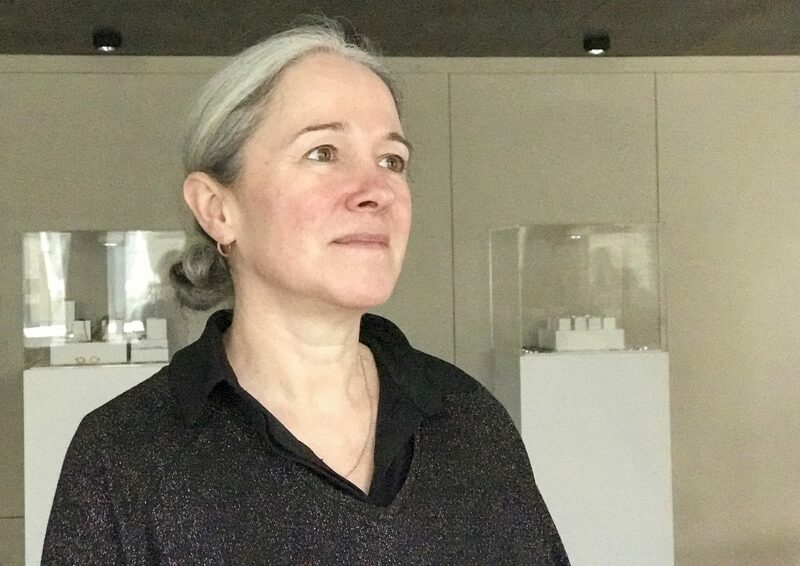 Ever thoughtful and enquiring, the award-winning, London-based jewellery designer and former Central Saint Martins lecturer explores ideas and concepts across continents as well as traveling back through history for inspiration. Steeped in narrative, her jewellery collections draw you in with their poetic names such as Sands of Time, Perpetual or Antumbra. “One of my first collections was called ‘In the Garden of Earthly Delights’, an homage to Bosch’s painting,” she says. Borne into a creative family — her father is a painter, her mother is a retired humanities teacher and her brother is an artist — Sian grew up exploring the beaches and countryside while “fossiling” near the world heritage site of the Jurassic Coast in Dorset. Her enduring passions for geology and archaeology developed on these walks and have influenced her work in a multitude of ways. 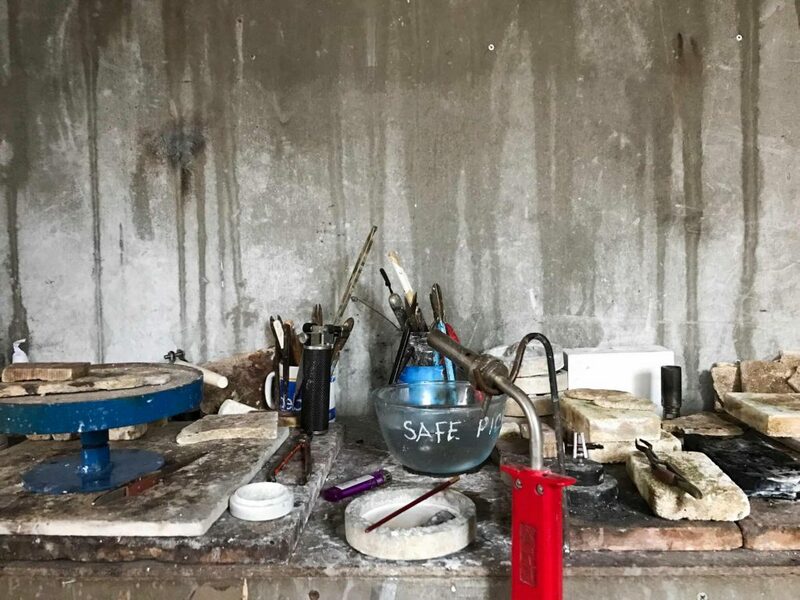 We recently joined Sian in her Clerkenwell studio to learn more about Sian Evans Jewellery, the company she started straight after finishing her jewellery design course at The Cass in 1986. From fashion jewellery to slow jewellery, the company has evolved like the woman behind it. 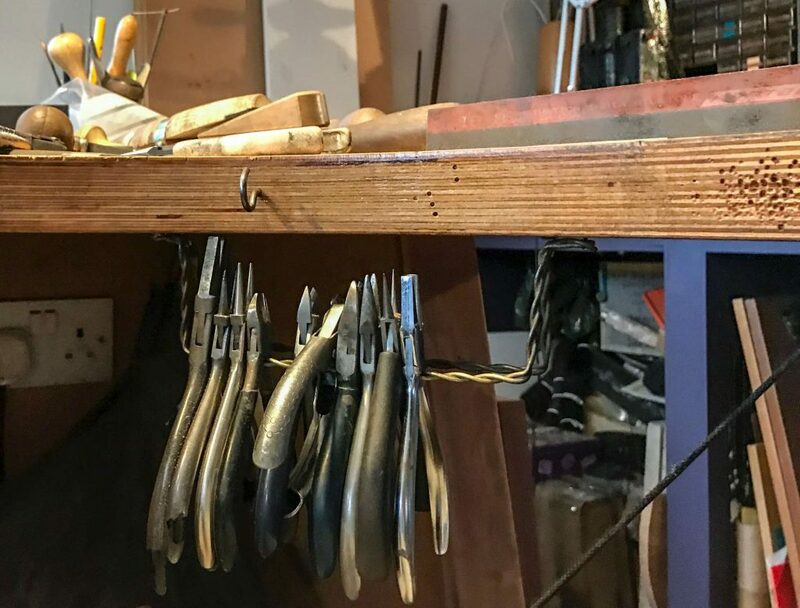 Above: Sian’s workbench in her Clerkenwell studio. 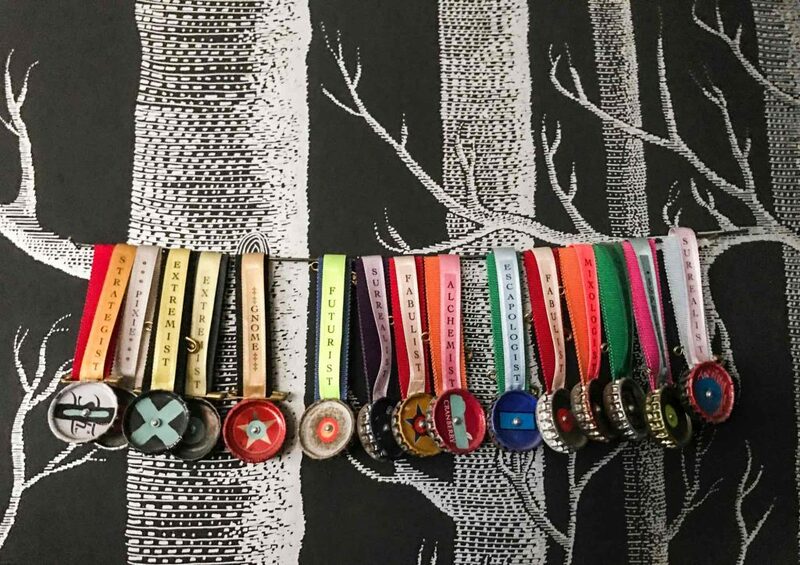 Fabulous Fabsters: How did you become a jewellery designer? Sian Evans: When I started my foundation course at the Bournemouth College of Art, housed in Mary Shelley’s lovely house by the sea, I thought I was going to be a painter. But then I decided that I liked making 3 dimensional objects. Having grown up in an area steeped in archaeology, I had been going on digs since I was eleven and was interested in artefacts and past cultures, particularly in how making things changed over time with technological advances. I was also very interested in fashion, so it was a bit of a toss-up. But because my best friend was obsessed with fashion and went on to do her BA in fashion, I couldn’t do the same — obviously. 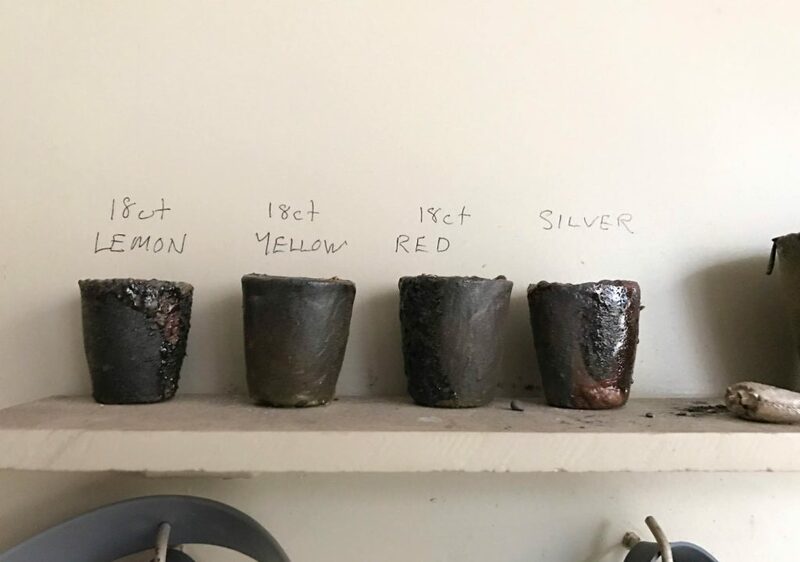 Knowing that I wanted to work with metals — blacksmith, silversmith, jeweller — I applied to several courses with wide remits rather than a single focus and I was given a place at my first choice at The Cass. Above Left: Sian at the age of fifteen with her first camera. Above Right: The jewellery lecturer speaks at a Central Saint Martins awards ceremony. 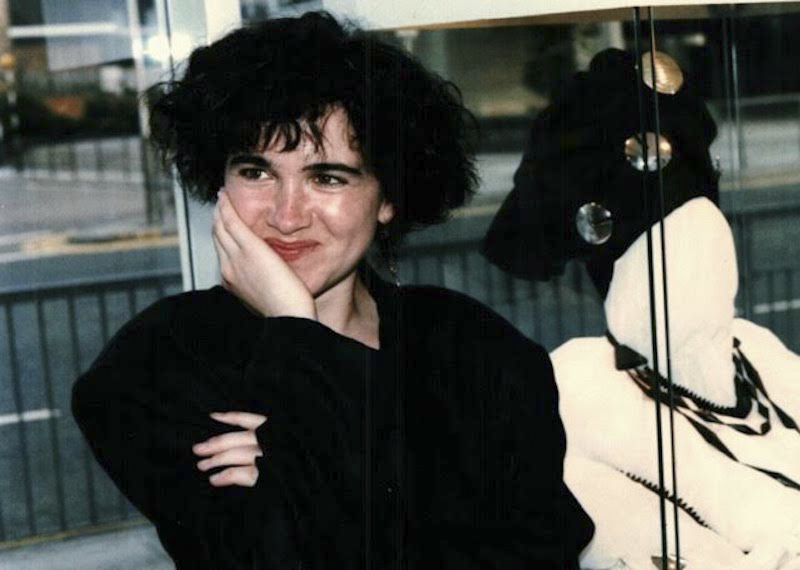 FF: You started SE Jewellery in 1986, when you had just completed your jewellery degree course at The Cass. What was your impetus for starting a business so quickly? SE: I graduated when I was 23 and while I really enjoyed my course, I was a misfit and was nearly thrown off several times for not following the assignments. Being both young and really cocky, I thought that many of the assignments were stupid. While the course taught me traditional making skills — brilliantly I might add — I wanted more. I wanted to be a designer — like a fashion designer — and study jewellery in the context of cultural history and how it might fit in with fashion. I filled these gaps in myself but I was really angry at the end of my course because it didn’t give me what I felt it should have. So I set up my business immediately after finishing my course because I wanted to show my family and my lecturers that I wasn’t a failure. I had a vision that they didn’t understand. 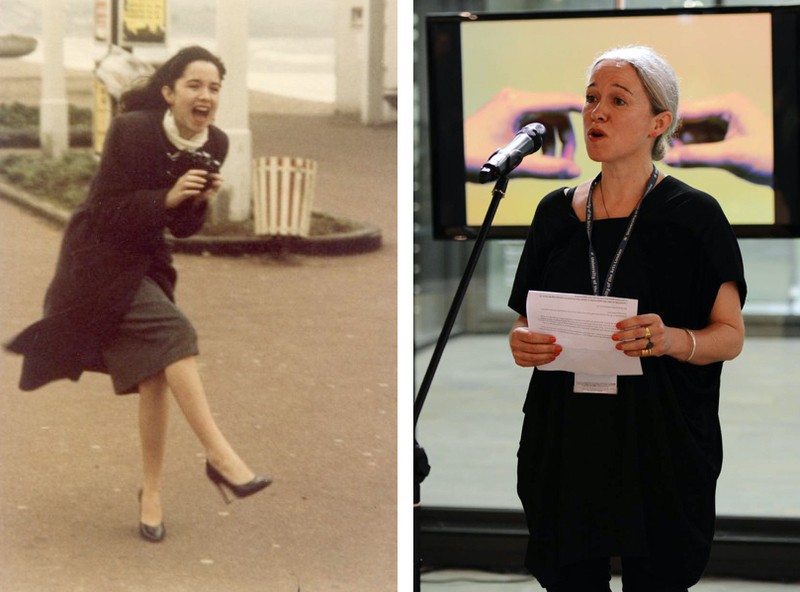 Above: Sian Evans celebrating at her degree show in 1986 with her designs on display. FF: And what was this vision? SE: My goal was to design and produce jewellery that would be sold along side the work of my two fashion heroes back then — Vivienne Westwood and Katherine Hamnett. I wanted my jewellery to be in the same shops that their clothes were in. That idea of having a multi-brand design boutique had only just taken off then. There were a few others, like Dinny Hall and Tom Binns that had graduated a few years before, who were repositioning jewellery into what eventually became “designer jewellery”. FF: And were you successful in your vision? SE: Yes, from one perspective, I was really successful. By the mid-90’s, my jewellery was selling in the States, Japan, Europe. In order to produce 4 collections a year for the fashion weeks in London, Paris, and New York as well as for New York’s inter season fashion week, I was employing more and more people — at my busiest I employed 8 people. I had definitely achieved my vision of selling my branded jewellery all over the world in designer shops. Above: Behind the scenes of jewellery making. “It’s a dirty business,” Sian says. FF: And then you began teaching jewellery design at Central Saint Martins where you taught for fourteen years from 2001 – 2015. Why? SE: For several years, I had been asked if I was interested in teaching but I kept declining because I was too busy here with the company. Eventually I accepted and I think one of the reasons was that I had become very disillusioned with what I was doing. I have a very enquiring mind but the success meant that I didn’t have a lot of time to design or to make. Instead, my job was to manage the company. I was burned out and didn’t have the freedom to create or the time to enable me to create. Doubting my ability to create, I became depressed. The whole experience kind of crushed me. Above Left: Antumbra is a collection of shadows. Each piece in the collection has an 18ct gold element that describes a shape and a silver element that shadows or ghosts the gold shape as seen in these earrings in three different sizes. Above Right: ‘Hard & Soft’ carved wood and oxidised silver bracelet sits within ‘Ancient & Modern’ patinated bronze and silver necklace necklace; both are designs of Sian’s from her Cass days in the mid-eighties. FF: And what did teaching do for you? SE: Teaching opened me up to so many new possibilities. In teaching you also have to keep learning, otherwise you carry on teaching exactly the same thing. Jewellery design is not fossilised, things move and change. Suddenly I had good reasons to go to all the exhibitions and shows and learn about celebrated jewellers’ practices and what they were doing. This was completely different from when I was in my own practise and my primary aim was to produce the best work that I could at the time to sell at Paris fashion week. Being at Central Saint Martins made me realise that I didn’t have to work in that way. FF: So teaching helped you regain your old self? SE: Yes, I suppose. But it wasn’t really regaining my old self. It was more like there was a new me. That bubble that I had got stuck in was like an echo chamber where I was feeding myself the same pieces of information. Working in an academic situation — one of the best in the world — you are constantly bumping up against all sorts of brilliant minds. I am a sponge and the constant stream of different stimuli was fantastic for me. Above: The various tools Sian requires for the intricacies of her craft are easily accessible under her workbench. FF: And meanwhile back at Sian Evans Jewellery? SE: Back at the office, I let the staff move on when they wanted to go and I didn’t replace them. The practise got smaller and smaller until eventually it was only me. This was wonderful because I no longer had to feed the machine and keep producing collections to maintain the turnover required to maintain the wages. I could actually come to my studio and be creative which liberated me from the shackles I had created for myself. Above: Ceramic vessels which hold the hot molten metals that will be made in to jewellery. FF: Since you stopped teaching 2 years ago, you have worked solely on your own. What is your focus now? SE: To do my practise, my way. My work was compromised when I was trying to feed the beast. I don’t care now. I just want to do the things I want to do and there are very specific things I want to do. SE: Instigated by my passions in geology and archaeology, I have great concerns about what we as humans are doing to our planet and it is one of the reasons why I decided at a young age that I would not have children. And in jewellery production, we encounter a particular set of problems. The primary one being that no one needs jewellery to survive. We need to eat and we also need shelter but we don’t need jewellery. And yet we have these urgent needs to express ourselves by what we wear — it’s part of being human — and this is where jewellery comes into play. Jewellery is a luxury and I’m fascinated by the fact that we don’t need it but yet we do. From a cultural anthropological perspective, the need to adorn is completely related to rites, rituals and placing oneself in society — social status. 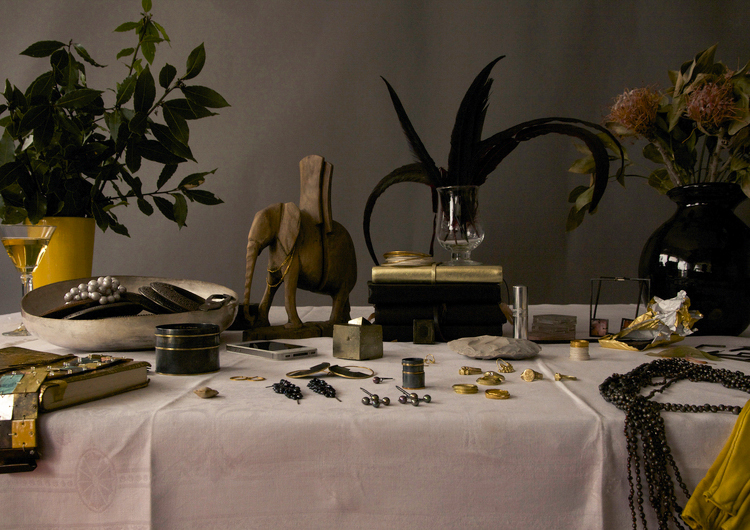 Above: Before — a collection of jewellery that a client has brought to Sian to rethink, redesign and remake. Above: After — the reworked pieces. I accept that people have a need to adorn, but since coming back to the practise 2 years ago after teaching, I have been working in a different way. I am very interested in where the materials I use come from and I use a lot of recycled materials. It’s not one hundred percent but it is something I am working towards. And from this way of working, I am receiving a good number of commissions from individuals who have old family jewels that are either broken or in a style not to their taste. I take and rework these old pieces into new jewels. So my clients are relying on my design skills and ability to make things, but I haven’t done anymore damage to any ecosystem or at least as little as I can. Yes, I am still using electricity and gas to make things but no one has had to mine anything or has had to suffer because they have been working in terrible conditions in the middle of the amazon jungle, digging gold out of sweltering pits. Above Left and Right: Brass designs for a recent catwalk show. Also, I have been found by the fashion industry again. So I’m doing special projects with fashion companies, which is not recycled. It’s great fun and tests my skills in a completely different way. Clothing brands that show at Milan or Paris fashion week come to me to design jewellery for their catwalk shows. It’s a completely different design process — usually very quick at a larger scale. The end game is different. By the back door, I might end up doing some wholesale again but this time I’m working on my own terms. A display of pieces from Sian Evans Jewellery along side the inspirations for the collections. FF: What do you want people to take with them when they own one of your pieces? SE: A sense of permanence — a jewellery piece that they will treasure for the rest of their life. In the work I do now, I invest my time and skills in good quality making and in doing the best I can with the materials that I am given to work with. Most of the time now, I’m working with a client who has seen my work and likes it. They are sharing a vision that I have. The things they’d like me to make for them have a relation to the things that I have made before. Each time I get a commission, I can test a little more about how far that story can go. Permanence — which is the opposite of fashion. 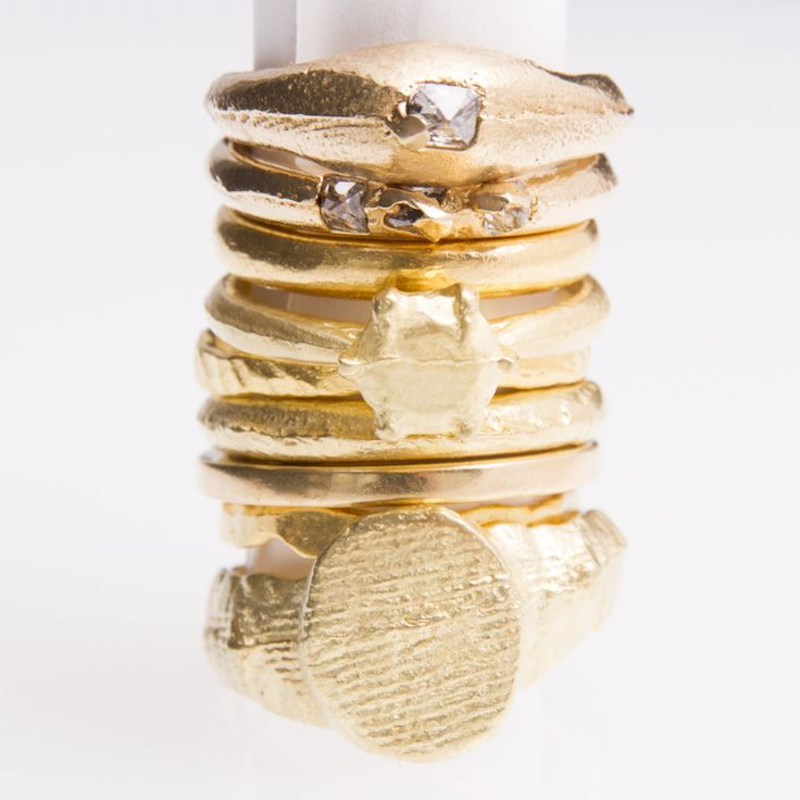 Above: A collection of gold rings by Sian Evans which reflect her design thinking in the last two years, including the Senate Ring, the Solid Solitaire Ring and the Signet Ring. The rings are all handmade and often with ancient techniques that result in textures and unique markings. SE: Keep it simple. If I really like something, I will buy more than one so I that look pretty similar. Most of my life, I’ve worn black. I did go through a slight Goth period but I don’t consider myself a goth — it’s fashion black! It’s partly practical as well because I’m in the studio all the time. Jewellery making is a dirty business. SE: I like making things so that extends in to the kitchen where I do a lot of cooking. I even bottle pickles and make jams. I mostly cook from scratch and I buy good quality ingredients. I eat meat and am a cheese monster. I don’t eat much sugar, which is helpful. FF: How do you stay strong and well in body and mind? SE: I stay sane because my practise allows me to focus and get into a flow. I do suffer from anxiety but when I’m in the studio and I’m making or drawing, the anxiety completely goes. It’s a huge huge pleasure to be able to have your life’s work the thing that keeps you well. I have also kept fit the whole of my life through meditative exercise. I walk to and from the studio — 4 miles — in the summer and I do yoga. SE: Don’t worry so much. It will all be all right. FF: What do you hold most dear to your heart? Above: Do no harm. Rethink. Recycle. Redesign — Ghost jewellery on the Jurassic Coast. Artwork by Christine Chang Hanway. N.B. : After interviewing Sian, I decided to commission her to design and make a ring for each member of our family. Read about it in f² — A Signet Ring for Our 21st Century Family. A Fabulous Fabster thank you to Sian Evans! Love Sian’s jewellery and so enjoyed reading her story. The idea of reworking old jewels is wonderful. The beauty of Sian’s jewelry is even more powerful when you see how each piece is crafted and the time, care and skill involved. It is a real pleasure to own and wear one of her creations.